SkyRide Buses are available outside Level 5, Doors 507-511 in the East Terminal and Doors 506-510 in the West Terminal at Island 5. Route information is available at the RTD counter on Level 5. Downtown Denver is serviced by Route AF. Routes AS, AB, and AF serve Stapleton Transit Center, where transfers to seven local routes are available. Buses leave from DEN to downtown Denver at 45 minutes past the hour from the West Terminal between 6:45am and 12:45am. Buses leave every 50 minutes past the hour from the East Terminal between 4:50am and 12:50 am. The route takes approximately 50 minutes and is $11 each way or $20 round-trip. Exact fare is required when boarding the bus. Round trip tickets must be purchased in advance at the RTD sales office on Level 5. Stops are made at Stapleton, the Downing Street Light Rail Station, the Denver Bus Center, and Market Street Station on the 16th Street Mall, which is two blocks from Union Station. Buses leave from the Market Street Station, Downtown to DEN at 30 minutes past the hour from 4:55 am until 11:25pm. Buses leave DEN every 15 to 30 minutes for Stapleton, taking approximately 25-30 minutes. Passengers may transfer to or from seven local routes at Stapleton. Cost is $8 each way or $15 roundtrip, exact fare only. Route AF and AB buses have underneath baggage storage areas. 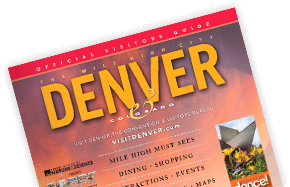 Buses leave Stapleton for DEN every 15 to 30 minutes from 3:35am-10:35pm and every hour from 10:35pm-12:05am.